The Ocean is a monstrous band--and not just by their formidable reputation. The band has seen scores of members come and go over their life span, but one figure has remained a constant presence over their thirteen-year history: frontman Robin Staps. 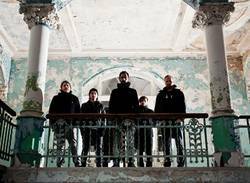 We at SPB had the distinct honour of asking him a few questions about the band, their new album Pelagial, and the philosophy behind it. Scene Point Blank: Congratulations on the release of Pelagial! Judging from the critical reception, the album seems to have gone over amazingly well. Robin Staps: Cheers. Yeah, I'm pretty excited about how everyone is raving about the record. 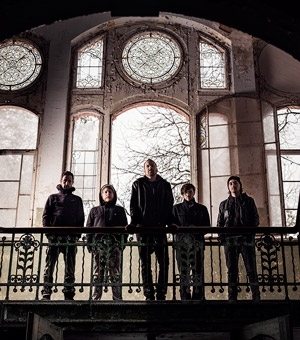 Scene Point Blank: Firstly, you mentioned in an interview that vocalist Loïc Rossetti's health had a lot to do with why Pelagial was originally recorded as an instrumental. How did writing without a vocalist change the creative process? And, when it was determined that Rossetti would be well enough to participate in the album, were there any challenges trying to fit lyrics and vocal lines to pieces that had been conceived and written to stand alone as instrumentals? Robin: Given the fact that there is a certain oddness involved with trying to write vocal lines for music that was written to remain instrumental, it all went surprisingly smooth. At first we were only planning to do vocals over the last two tracks of the album, "Demersal" and "Benthic." It seemed fairly easy to come up with vocals for these tracks and the idea was that by the time everyone was expecting this to be an instrumental album, boom, all of a sudden there's vocals. So we started recording those two tracks and that went down pretty quick and then we were hungry for more and started fooling around with different parts of the album. Within a day or two we had some amazing vocal parts written and then it was already too late. We were attached to them somehow and wanted them to be on the album. But we were aware that this meant that now we had to write vocals for the entire album—it wouldn't have made sense to only have bits and pieces here and there…and so we just went for it. What followed was an awesome creative session between Loïc and myself, we spent some 6.8 hours in the studio every day for a week or so, and by the end of that week we had pretty much all vocal patterns written for the entire album. Scene Point Blank: Unlike the rest of your releases, Pelagial doesn't seem to be a paired release. On your earlier albums (Aeolian /Fluxion and the two discs of Precambrian), the division seemed to clearly segregate the sludgier and more atmospheric styles of music from one another. However, that line seemed to become heavily blurred with Heliocentric and Anthropocentric. How does the band stand now in relation to those divisions, if they are even meaningful anymore? Are there still two distinct sides to the band, or is that a thing of the past? Robin: That is indeed a thing of the past. When I started this band, it was all about creating sharp contrasts and about taking on different artistic identities. And I still find contrasts interesting, but I don't need a strict separation between "heavy" and "mellow" tunes any more, and I don't feel like assigning the heavy tracks to one record and then the more mellow songs to another disc. I find it more interesting to try to cover as much musical and dynamic territory within the course of one album, or even one song; and I also find it more interesting to work with gradual evolution within a song or an album, as opposed to sharp breaches. I may sound like 2Pac here, but music is all about the flow to me these days. Scene Point Blank: On a related note, where do you want the band to go in the future, stylistically? Are there any other directions you are keen on moving in, or are you content building on where you are right now? Robin: I am trying to live in the present tense as much as physically possible and I try to not think much about the past or the future. So I really can't answer this one. I am not thinking about the next album yet, we just finished this one a few months ago and now is the time to tour and surf on the Pelagial wave for a while…so I have no idea where the next album will take us, musically or stylistically. One thing I am getting increasingly interested in is Oriental music, and I do feel how this is having an impact on what ideas I have in my mind recently. Scene Point Blank: Pelagial is a huge work, artistically. Not only are there two different recordings, there are a lot of other pieces related to the album, like the artwork by Seldon Hunt and the accompanying movie from Craig Murray. What was the motivation to extend this work into so many media, and how do they expand upon the music itself? Robin: Seldon Hunt has perfectly visualized, in 2D, the journey from the surface to the bottom of the sea that is this album -- by means of illustrations based on a gradual color blending from light blue to black, over the 10 panels of the digipak or the gatefolds of the vinyl. Craig Murray has visualized this journey in 3D. There is lots of oceanic footage of course, some of which I shot myself in Australia last spring, but there is also a female protagonist (who goes by the real life name of Arielle, funny enough). She is going through different stages of joy, pain, fear and lust throughout the movie, as she drowns and sinks towards the abysses of the deep sea. Her character makes reference to the lyrics, which are an inward journey from the surface into the abysses of the human psyche, analog to the journey from the surface towards the bottom of the sea. Scene Point Blank: What's the best way for a listener to approach all of this so that nothing is missed? Robin: Get the 4x10" or CD box set that is available from www.pelagic-records.com. These acrylic box sets, which come with one printed acrylic layer for every pelagial depth zone, are the realization of the full vision I had with Pelagial, from the artwork to the packaging to the music to the video side of things -- the enclosed Pelagial DVD, which has a 5:1 Dolby Surround mix of the instrumental album, is the most complete Pelagial experience you can get. Scene Point Blank: The album was designed not only to aurally reflect a journey to the bottom of the ocean, but also describe an analogous journey into the depths of the human psyche. The lyrics, accordingly, seem to reflect a lot of questions that arise from discussions of free will and agency. What do you think is actually at the heart of the human subconscious? How much are we really ruled by our unstated desires and motivations? And how comfortable are we going to be if we do succeed in looking that far into ourselves? Robin: Not very comfortable, so much is sure. I believe that freedom of will, freedom of decision-making, etc., is a farce to a large extent. In modern philosophy, instrumentalist rationality (how to get something) is being differentiated from prudent rationality, which addresses the question of whether our goals, desires and wishes themselves are rational or not. But this is beyond the scope of rationality in my opinion, and hence I don't think something like prudent rationality exists. Our wishes and desires are at the root of all our actions. If I have a desire to do something which is harmful to others, for example, then I can decide not to do that because of certain implications. But this is not going to affect my desire to do it, this is just restraining it, and this is as far as rationality can potentially reach. Scene Point Blank: After discussing fundamentalist Christian beliefs on Heliocentric and Anthropocentric and now discussing the human psyche on Pelagial, what other philosophical topics are of interest to the band? What do you see yourselves writing on in the future? Robin: Again, I live in the present tense and I am not even thinking about our next album yet. Scene Point Blank: Speaking of the future, can you share any more details on what's in your upcoming 3xDVD release Collective Oblivion? Robin: Collective Oblivion is going to be released in October or November 2013. It will be a 3xDVD with loads of content. DVD 1 will feature a complete band history, from the early days of the collective until today. DVD 2 will have two complete live shows, from Summer Breeze Festival in Germany and from the Heliocentric record release show in Switzerland, where we played with a lot of extra players—11 people on stage. Also some clips from a special show at the museum for musical instruments in Berlin, where we included some historic 16th Century instruments into our performance. DVD 3 will have video tour blogs from North America, Australia, China, and Russia, as well as live clips from all over the globe. The DVD comes with a massive 30-page booklet with more tour diaries and photos from 2001 until today. Scene Point Blank: We know it's a bit trite, but forgive us, we just have to know. What are you guys listening to these days? Are there any bands you think aren't getting enough attention or praise? Robin: The latest Bosnian Rainbows and Baptists albums are currently on heavy rotation on my iPod. 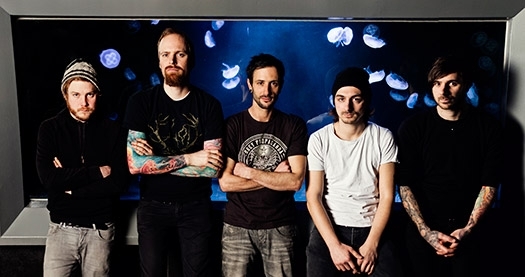 As for bands not getting enough attention, definitely check out that band ABRAHAM from Switzerland that I am releasing on my label Pelagic Records. They are quite incredible. Another band is Family from NYC, also on my label. This band should get a lot more attention than they do. Scene Point Blank: Thanks again for your time! Words by Sarah on Nov. 30, 2013, 5:17 p.m.
Posted by Sarah on Nov. 30, 2013, 5:17 p.m.
Posted Sept. 14, 2015, 10:17 p.m.
Posted Feb. 22, 2014, 11:55 a.m.
Posted June 14, 2013, 9:41 p.m.